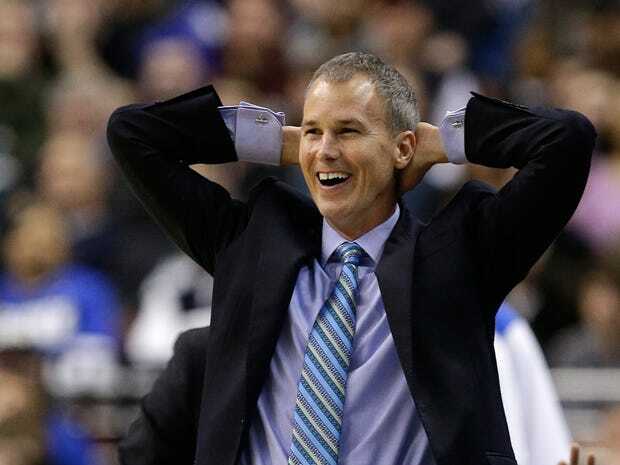 Andy Enfield is taking Dunk City from Southern Florida to Southern California. USC athletic director Pat Haden has confirmed that Andy Enfield has agreed to leave Florida Gulf Coast and take the helm as coach of the Trojans. Normally a coach with a career record of 41-28 in the Atlantic Sun conference would be a bizarre move for a team with the conference prestige and program credentials of a school like USC, but this is one of those fits that is too good to overlook. Is it a bit of a reach to hire Enfield after just two season of head coaching experience in southern Florida? No one can deny that it is, but Enfield has a lot going for him and not just the fact that he has made a lot of money and is married to a supermodel. Enfield has all of confidence that is needed and is coming off the most entertaining run to the Sweet 16 ever. (I would have prefaced that with ‘arguably’, but I don’t think anyone can successfully argue against it). Remember that USC is not UCLA. They have a lot more football tradition than basketball tradition. That being said they have been contenders in basketball and have had several very good players. USC has had a recent taste of success, making the tournament six times from 2001-2011. They have suffered through the last four season with Kevin O’neill at the helm which proved to be an underachieving debacle of epic proportions, resulting in some of the darkest days of USC basketball ever. There were sanctions in place for part of KO’s tenure but there is no denying the fact that USC has been awful the last few years. Enfield has his work cut out for him but he has the confidence and more importantly the ability to instill confidence in his players that he will need at USC. USC’s new coach has a lot going for him. He plays an up-tempo, fun, no-holds-barred, dunk-first-ask-questions-later style of offense. He is an adapter on defense playing several different styles. He seems to be a coach players genuinely like and like to play for. Combine all of the pluses and they definitely outweigh the minuses. This was the right hire at the right time for the Trojans and for a program that has been in the tank in recent memory this breath of successful fresh air couldn’t come soon enough.